This change, sought nearly exclusively by Democrats, won’t take effect unless enough states sign on to the premise and commit their votes. The magic number is 270 electoral votes. The addition of Colorado’s nine brings the current tally of votes in what is dubbed the “National Popular Vote Interstate Compact” to 181. The underlying premise is that instead of voters in a state coming to an agreement on whom they wish to be chief executive, and then committing their state’s voice to that candidate, the state will instead wait to see what happens with everyone else, and then go along with that. Under the current system, the presidential election is in the main decided by the “battleground” states, and it is there that candidates tend to focus their campaigning. Under the proposed “national popular vote” method, large concentrations of population, primarily in liberal coastal states, will be the driving force in politics. Thus it is the case that issues which matter to people in Colorado, for example, will not have the same importance as issues which affect New Yorkers. Just as battleground states now absorb and pre-occupy candidates, under the proposed system it is logical to conclude that issue campaigning would focus on the particulars and peculiarities of large, dense population areas. To visualize this, just imagine candidates spending a great deal of time talking about regulating Uber, or water management in California, and very little time campaigning on corn subsidies or the concerns of farmers. 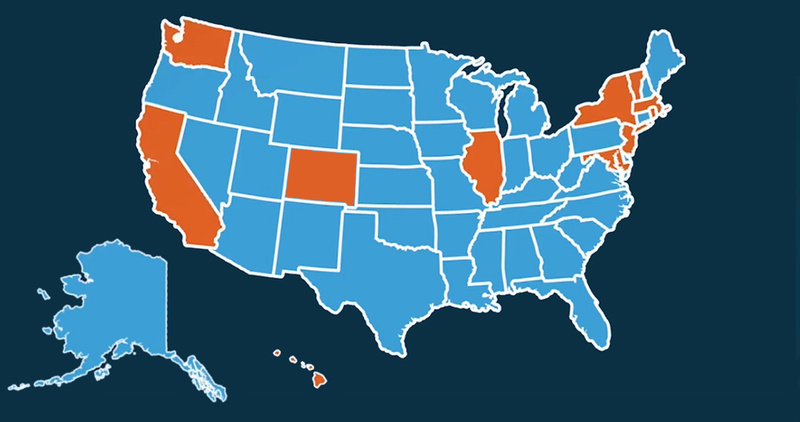 TheBlaze has a lot more on the subject here, including maps and a full explainer from PragerU. Not everyone sees that change as disadvantageous, but in large part Republican legislatures do. In the case of both former President George W. Bush and President Donald Trump, a national popular vote would have meant the Democrat in office instead, a fact not lost on the GOP in mounting opposition. The broader political push among liberals is not merely on the matter of the electoral college vote for president, however. There has been widely shared sentiment that all power should be stripped away from states with lower populations than California and New York. The idea that there is a House or Senate “popular vote” is logically nonsense, but the romanticized idea of it has gripped liberals in the wake of 2016. A national popular vote would certainly be convenient for Democrats. They wouldn’t have to worry about talking to Fox News anymore, after all.